Android allows user to notify on new message arrived as well as some calendar – based events by notification.Notification is a user interface element that will display outside of any other app’s normal UI to indicate that an event has occurred. Users can choose to view the notification while using other apps and respond to it when it’s convenient for them. 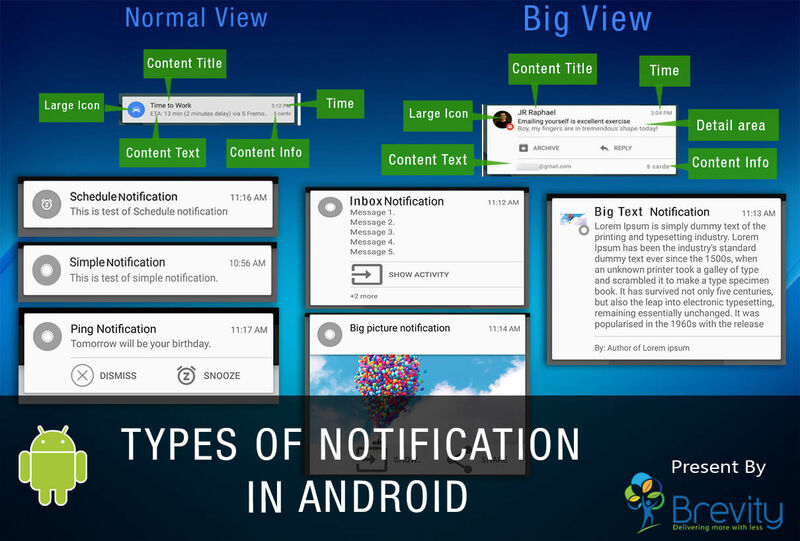 Android notification will be displayed in the Notification area and to see the details regarding the notification, the user can expand it in by open the Notification drawer. We will discuss about Local notification and Heads Up Notification here. To create notification we have to use NotificationCompat.Builder’s object. Notification itself build by NotificationCompat.Builder.build(), which returns a Notification object containing with specifications of notification. A Notification object must contain setSmallIcon() to set a small icon, setContentTitle() to set title and setContentText() to set detailed text. Another settings and contents are optional. To set action like as call another activity directly by clicking on the notification, we have to use PendingIntent with containing an Intent which starts an Activity of our application. We can set notification priority using NotificationCompat.Builder.setPriority() by passing one of the NotificationCompatpriority constants. To expand the layout of notification we have to use Builder.setStyle() with NotificationCompat.Builder object. Note: Expanded notifications are not available on platforms prior to Android 4.1. The big picture contains a bitmap up to 256 dip tall in its detail section. Sometimes the user needs to schedule a notification to notify a user at a particular date/time, even though the user has not opened the application. For this, we have to use BroadcastReceiver of Android SDK. We will discuss BroadcastRreceiver below. In addition to the above class, we also have to use AlarmManager class to schedule and add events. AlarmManager has access to the system alarm services. With the help of it, you can schedule execution of code in future. AlarmManager object can’t instantiate directly however it can be retrieved by calling Context.getSystemService(Context.ALARM_SERVICE). AlarmManager is always registered with Intent. When an alarm goes off, the Intent which has been registered with AlarmManager is broadcasted by the system automatically. This intent starts the target application if it is not running. It is recommended to use AlarmManager when you want your application code to be run at a specific time, even if your application is not currently running. A Broadcast Receiver (short receiver) allows you to register for system or application events. All registered receivers for an event are notified by the Android runtime once this event happens. Excellent post. I was checking constantly this blog and I’m impressed! Very useful info specifically the last part 🙂 I care for such info a lot. I was looking for this particular information for a very long time. Thank you and good luck. Nice Post, Thanks for sharing this post. I just want to tell you that I am newbie to weblog and actually loved you’re blog site. Most likely I’m going to bookmark your site . You surely have great well written articles. Bless you for sharing with us your web-site.